The Teryx and Teryx4 side x sides are built strong to take playing hard to the next level. For the family looking to spend time together outdoors or the group of friends looking for an adventure, the 2017 Kawasaki Teryx Lineup provide the ultimate vehicles for fun on the trail. Assembled out of domestic and imported parts, the Teryx and Teryx4 side x sides are versatil enough to provide thrills for the whole family on the trails with standard Electric Power Steering (EPS), a 783cc V-twin engine combined with FOX Podium 2.0 suspension and rugged enough to help out with chores with plenty of torque and 1,300 pounds of towing capacity with a optional draw bar. The Teryx and Teryx4 side x sides are built strong to take playing hard to the next level. The aggressive front end styling and polished 14-inch cast aluminum wheels (LE models) join a roomy cockpit on the Double X frame to help you comfortably and confidently conquer the trails. With a 783cc engine that generates its power and torque in the low- and mid-range of the powerband, the Teryx is very capable in any environment. The purpose-built 90-degree V-twin engine delivers great fuel efficiency, while also having enough torque and power to conquer the trail. Transferring all that torque to the ground is a Continuously Variable Transmission (CVT) with a centrifugal clutch assembly, and a three-mode switch selectable four-wheel drive system that allows access to either 2WD (light steering, great handling), 4WD or 4WD + Front Differential Lock. The latter helps to provide optimum traction by simply rotating a dash-mounted switch. The CVT provides a quick response and direct engine “feel” in sportier riding situations, and its unique engine braking ability increases driver confidence on descents, while turning and in a variety of conditions. So whether carving on trails through the woods, carefully crawling up a rocky trail, or ripping through the open desert, the Teryx side x side has the ideal drivetrain mode to handle it. Precise steering with little effort is the hallmark of the standard Electric Power Steering (EPS) system in the 2017 Kawasaki Teryx side x side. The Showa-built system eliminates the need for a traditional power steering pump, so steering inputs do not rob the engine of power. In fact, the EPS is only active when the engine is running, so there’s also limited battery drain. Input from vehicle speed and torque sensors determine the amount of steering assistance required, giving more during slow-speed use, and less as speed increases, similar to a state-of-the-art sports car. EPS offers additional benefits, especially on rough surfaces, where reduced steering kickback and bump- steer mean less fatigue for the driver. All Teryx and Teryx4 models come standard with tilt steering column. It allows the steering wheel to be tilted to a position that suits the driver, or can be moved out of the way to ease cabin access. 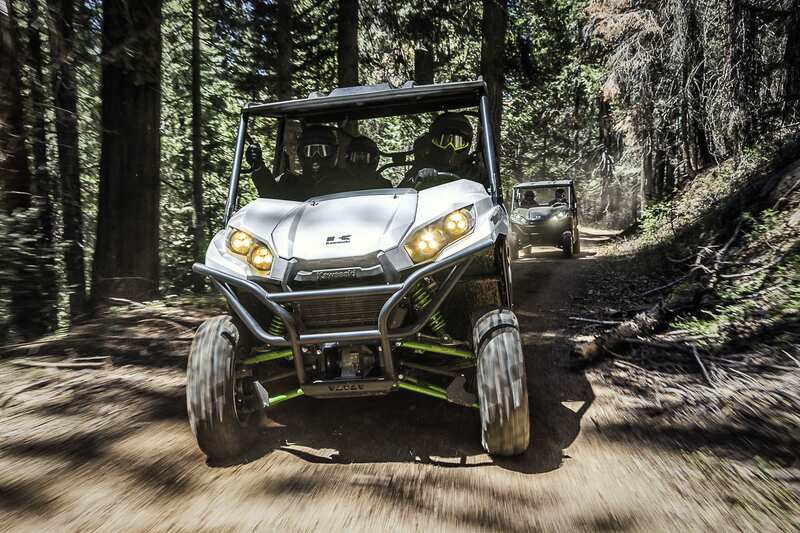 To reflect its sporty performance and handling, all Teryx models have received a thicker steering wheel. This is designed to be more comfortable in the driver’s hand, giving more confidence on trails and improving the overall feel of the driving experience. The durable Double-X frame construction of the Teryx4 side x side takes technical terrain in its stride. 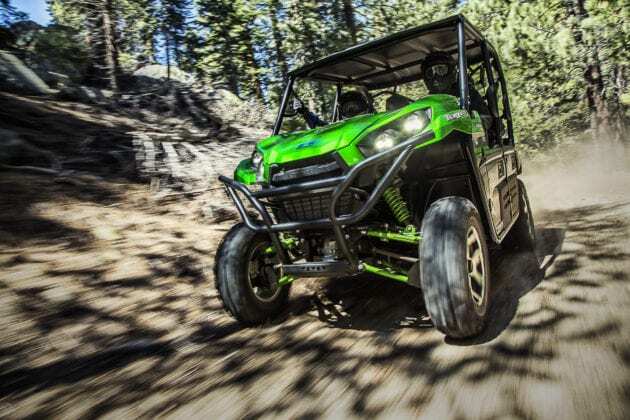 The rigid, square tube chassis effectively combats flex to help provide superior handling over rough ground. This stout frame was designed using detailed computer analysis and plenty of off-road testing. It features two X-shaped crossmembers bridging the frame’s box structures from corner-to-corner to improve strength and durability. Maneuvering on the trails is easily accomplished with the tight 16.7 ft turning radius, reducing the need for multi-point turns. The Teryx and Teryx4 side x sides have underbody engine guards that help shield vital components by acting as a skid plate when traversing rough terrain. This impressive chassis package is further enhanced with a wide-track/wide-body design, which contributes to superb handling characteristics. The wide track helps the driver maneuver during cornering and boosts the ability to navigate rough terrain. Mid-engine placement also helps by centralizing the vehicle’s center of mass, which reduces the turning inertia and promotes more fluid directional changes. Large 26” Maxxis Bighorn 2.0 tires offer the type of ride comfort, control and traction you would expect from a Teryx4 side x side. Their construction and tread design helps maximize forward traction, while optimizing driver feedback for cornering. The vehicle also offers a substantial 11.2” of ground clearance, helping to prevent it from high centering when cresting a ridge or obstacle. The high approach and departure angles (79- and 65-degrees, respectively) also reduce the possibility of catching the front bumper when approaching a steep slope, or scraping the rear when exiting. 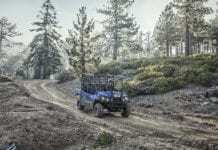 The Teryx side x side incorporates one of the best names in the high-performance suspension business, FOX, for its four wheel independent suspension. The steel A-arms at all four corners are mated to adjustable FOX Podium 2.0 remote reservoir coilover shocks that offer 8” of plush travel up front and 8.3” out back, giving the Teryx side x side plenty of comfort on the trail. Kawasaki engineers fitted the Teryx side x side with the ultimate high-performance FOX Podium 2.0 shocks, which are adjustable for spring preload and 24-way compression damping, to tailor the ride to the terrain or the rider’s preference. The adjustable FOX Podium 2.0 coilover shocks provide everything from cruising comfort with four passengers and a full cargo bed on the Teryx4 to a sporty, more bump absorbing ride for a solo driver. Balancing comfort and performance, the FOX Podium 2.0 shocks maintain consistent, progressive and fade-free damping in all driving conditions. 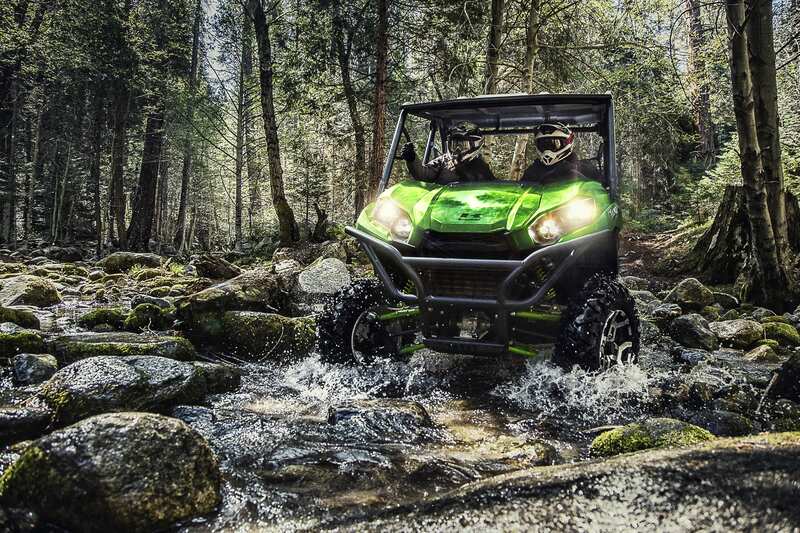 Brake performance is essential for the Teryx side x sides and is delivered with high performance hydraulic disc brakes up in the front and a sealed internal wet brake in the rear. With 200mm rotors gripped by dual-piston calipers for exceptional feel and stopping power mounted up front, the brakes are recessed within the wheels to help keep them free from debris, while the sturdy steel-braided brake lines help keep a crisp, progressive pedal. At the rear, Kawasaki employs its unique sealed internal wet brake, which features internal components that are completely sealed from the elements, providing a maintenance free braking performance whether descending hills or running on trails. The Teryx and Teryx4 side x sides excel in all types of uses, from hauling family members or equipment to towing. The Teryx features a 27.6 x 43.3 inch cargo bed that is 10.4 inches deep and boasts a heavy-duty 600 lb payload capacity, while the Teryx4 has a 17.9 x 47.6 inch, 250 lb capacity cargo box that is 8.7 inches deep. The cargo bed has a flat bottom that can carry a large cooler or other supplies out on the trail. The bed has KQRTM (Kawasaki Quick Release) rails with quick release capability, which allow for quick-mounting of Kawasaki Genuine Accessories and/or tools to the bed rails. Four tie-down loops also help secure the cargo. The Teryx also features two rear storage compartments with lids that offer 48 gallons of storage capacity. The vehicles feature a latching tailgate, which can be removed without requiring tools for greater capacity. The tailgate also features molded drink holders for added convenience. A 2” hitch receiver is standard equipment. This allows the Teryx or Teryx4 side x side to tow up to a substantial 1,300 lb once equipped with the optional draw bar. Convenience features on the 2017 Kawasaki Teryx side x side include two DC power outlets (three on Teryx4, two up front and one in the rear) providing up to 120 watts of peak electrical power. Almost eight gallons of fuel capacity and impressive fuel economy mean both the Teryx and Teryx4 have substantial range, enough for a long day out with your friends or family. 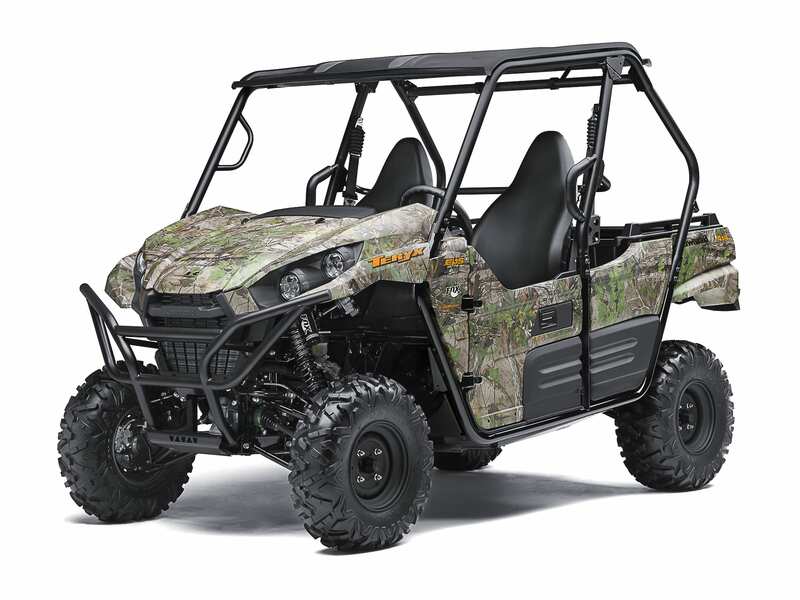 There’s also a sun top to maximize comfort, which comes standard on the Teryx4 LE and Camo models, plus conveniently located beverage holders for each occupant. The dashboard layout incorporates four accessory switch knockouts, allowing Teryx side x side owners to operate their chosen Kawasaki Genuine Accessories, such as a winch, auxiliary LED lighting, etc. The dashboard is also able to accommodate the Kawasaki Genuine Accessories audio system to provide music or news throughout the day. A number of convenient storage pockets were also incorporated into the new dash design to increase its utility. An aggressively styled front end includes a removable hood and scratch-resistant front bumper. Along with its angular fenders, the Teryx and Teryx4 side x sides have a look that says “sporty” and “functional” at the same time. New lightweight polished 14” cast aluminum wheels on the Teryx and Teryx4 LE models add even more style to the overall appearance. The LE models also feature a strong tubular-steel front brush guard and four high-intensity LED headlamps that have two switches with both low and high beam, allowing you to light the trail as you like (four LED lights are also standard on Camo models). Textured paint on the brush guards and ROPS cage help keep the vehicle looking sharp even after hard use. The Teryx and Teryx 4 side x sides are two of the most comfortable vehicles in their class, meaning your family and friends will want to spend more time out on the trails. The roomy interior gives the driver and passengers plenty of hip, shoulder and leg room. Three-tone high-backed bucket seats feature high-quality cushioning and cold-resistant seat material for all-day plushness. The high-back adjustable seats eliminate the need for a headrest and feature wrap around ergonomics to hold driver and passengers firmly in place. As a new feature, the driver’s seat can now be adjusted 50mm while in the seat, allowing different sized drivers to comfortably get behind the wheel. When the going gets rough, three-point seatbelts, help to keep the driver and passengers in place. Shock- absorbing comfort mounts and an anti-cinch feature on the seatbelts also help prevent over-tightening when the belts lock during sudden deceleration (or when the tilt sensor is activated). 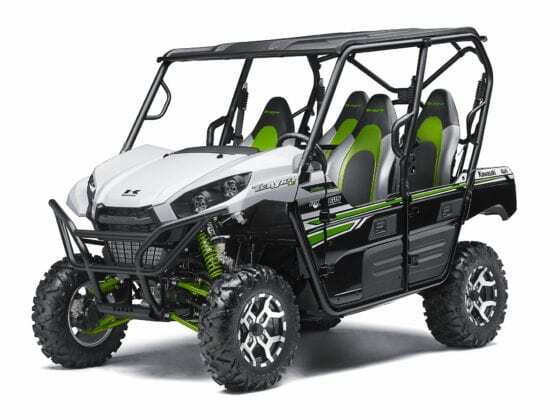 New for 2017, the Teryx and Teryx4 side by sides feature a speed limiter that keeps the vehicle from exceeding speeds of 15 per hour if the driver is not wearing a seatbelt. All the Teryx side x side models feature premium factory-designed latching doors that are easy to use, look good and offer a high level of mud protection. The instrumentation includes a multi-function electronic display that provides an array of useful information: speedometer, fuel gauge, odometer and hour meter, clock and dual trip meters. There are also indicator lights for the 2WD/4WD, front differential, parking brake, water temp and a fuel injection warning, plus a reverse indicator giving you the information you need at a glance. Both the two-seat Teryx side by side and the four-seat Teryx4 side x side are available in three different levels of specification. All feature the same combination of a powerful, reliable engine, selectable four-wheel drive, durable, tough chassis, sporty suspension and all-round versatility and fun. The base model for both are the Kawasaki Teryx side x side and the Kawasaki Teryx4 side x side, which are equipped with the advanced Electric Power Steering to help the ease steering at lowers speeds and reduce bump steer at on rough terrain. The base models are available in Super Black. The Teryx LE and Teryx4 LE models incorporate everything on the base model, while adding lightweight 14” cast aluminum wheels for extra style. These wheels are fitted with 27 inch Maxxis Bighorn tires to give the driver confidence in cornering, outstanding performance in rough terrain and a more comfortable ride. 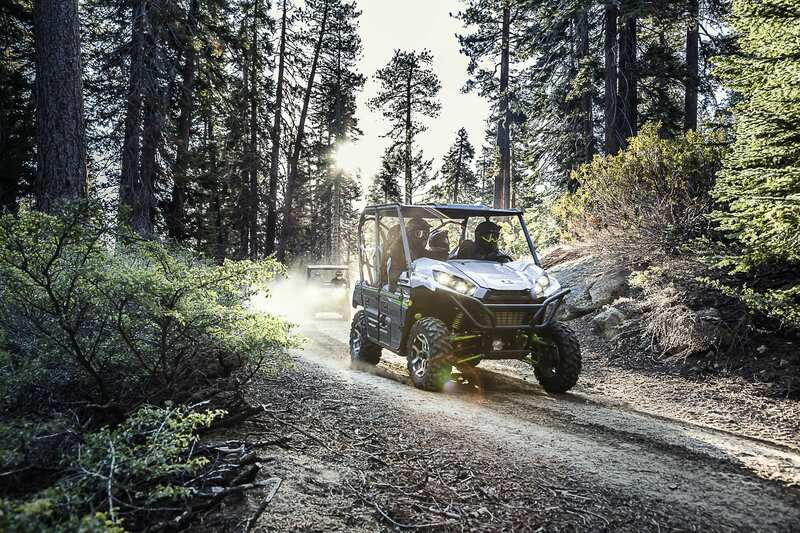 In addition, the Teryx LE and Teryx4 LE models boast four powerful LED headlights and a hard sun top to help protect the occupants from the elements. 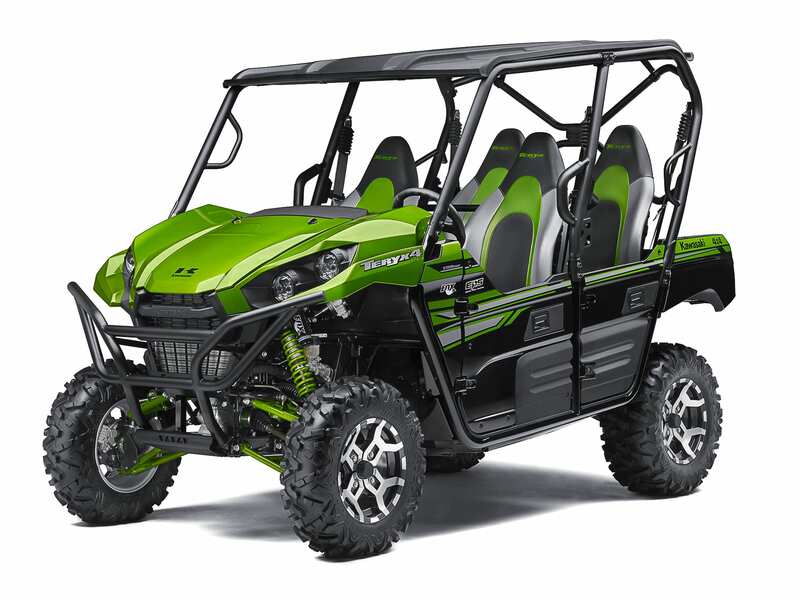 The 2017 Teryx LE can be purchased in Candy Matte Burnt Orange or Candy Lime Green paint, while the 2017 Teryx4 LE is available in Metallic Stardust White, Candy Matte Burnt Orange and Candy Lime Green. Finally, there is the 2017 Teryx Camo model, which is equipped with standard EPS,four powerful LED headlights and a hard sun top. As its name suggests, the Camo model is finished in the authentic Realtree Xtra® Green Camo pattern that makes it ideal for hunters and outdoorsman who want to maintain a low profile while off-road. 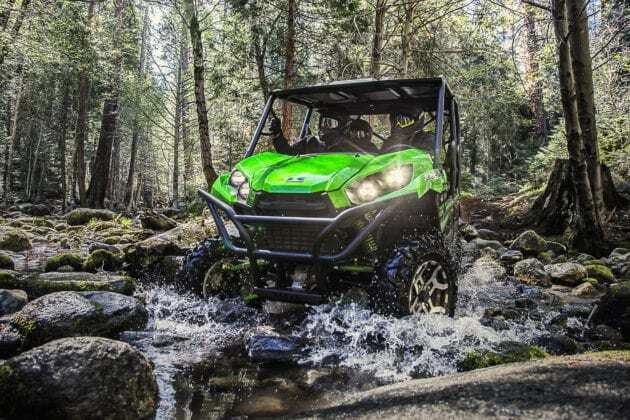 The Teryx and Teryx4 side x side lineup is capable, comfortable and durable and backed by the Kawasaki STRONG 3-Year Limited Warranty. Kawasaki Teryx and Teryx4 side by sides offer strength, comfort, power, convenience, hauling and towing ability and reliability that make them versatile machines out on the trails. A large selection of Kawasaki Genuine Accessories is available through authorized Kawasaki dealers across the country. As with all off-highway vehicle recreation, Kawasaki encourages side x side users to drive responsibly and to respect the environment. All Kawasaki Genuine Accessories are developed in conjunction with the vehicle to ensure a perfect fit and functionality. They include items such as a snowplow and several WARN® winches. There is a soft cab enclosure, fabric, plastic and aluminum roofs as well as full-length fabric doors. There is a cargo box system that secures to the cargo bed using special clamps. Teryx4 side x side owners can also purchase an audio system, auxiliary lighting, tow hitch balls, a full and half windshield as well as gun cases and a mounting system. To help protect Teryx and Teryx4 vehicles off-road, there is a full complement of underbody guards and skid plates from front to rear, as well as light guards, a rear bumper, fender flares and more. Kawasaki Heavy Industries, Ltd. (KHI) started full-scale production of motorcycles over a half century ago. The first Kawasaki motorcycle engine was designed based on technical know-how garnered from the development and production of aircraft engines, and Kawasaki’s entry into the motorcycle industry was driven by the company’s constant effort to develop new technologies. Numerous new Kawasaki models introduced over the years have helped shape the market, and in the process have created enduring legends based on their unique engineering, power, design and riding pleasure. In the future, Kawasaki’s commitment to maintaining and furthering these strengths will surely give birth to new legends. Partner and Editor at UTV Planet Magazine. UTV Planet Magazine is a periodical published by Raven Media INC dedicated to the sport of UTV off-roading. © 2017 Raven Media. All rights reserved.